BETTER DESIGN - New LED modules produce 105 Lumens per watt - Save even more by using a lower watt unit. Compare the lumens against others. 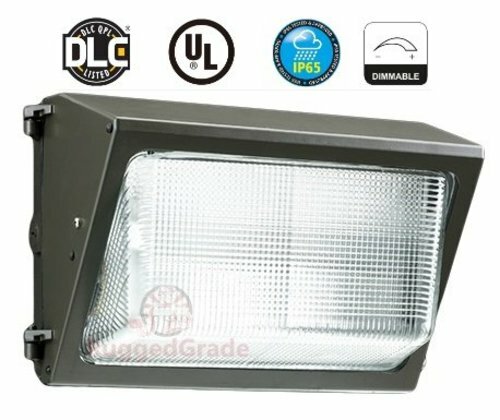 Premium grade components make this an industrial grade LED wall pack. 3 Conduit entries and included gasket for easier installation. BRIGHT LIGHT - 4160 Lumens can replace a 350-400W HPS/HID/HALIDE light. 5000K light color ensures a bright clear light. DIMMABLE - 1-10V Dimmable. Light can be dimmed to ideal brightness levels to save energy and get the light levels for your area. BUILT TO LAST - 100,000 LED - Aluminum Housing with Tempered Glass. Heat Resistant and impact rated. Silicon gasket and IP65 Waterproof rated. All backed by a 5 year warranty. CERTIFIED - UL Listed and DLC verified for safety and rebate eligibility. UL Certified products ensure better quality, safety and reliability. DLC is the Design Lights Consortium for independent verification.